This application note elaborates the steps required to configure OpenLM to interface the EasyCopy License Manager, and obtain reliable license reports and usage statistics. This capability is available for Easycopy versions 8.7.12 onward. Select the License Servers tab. From the Type drop-down menu, select OpenLM Generic..
Insert a description in the Description text box. Set the Time Zone to where the License Server physically sits. Submit an appropriate Hostname and Port numbers. For this server the Port number is insignificant. Submit any two-digit number. 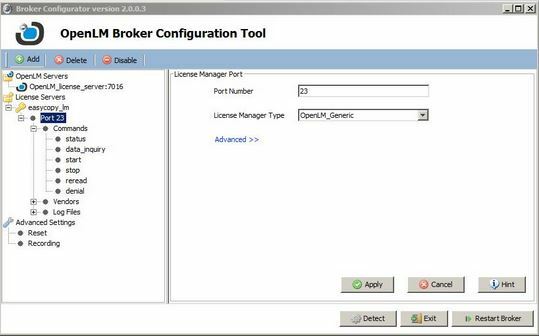 NOTE: The same number will need to be used in the OpenLM Broker configuration as well. 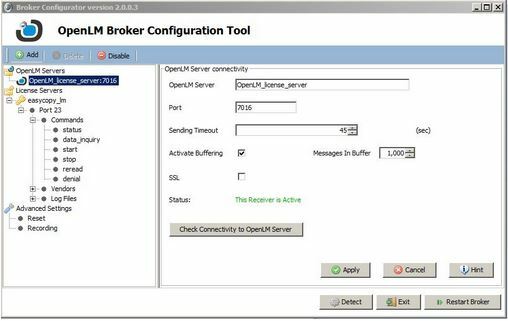 See OpenLM Broker Configuration below. Is Triad Configuration: This configuration is reserved for FlexLM license managers only. Keep it unchecked. 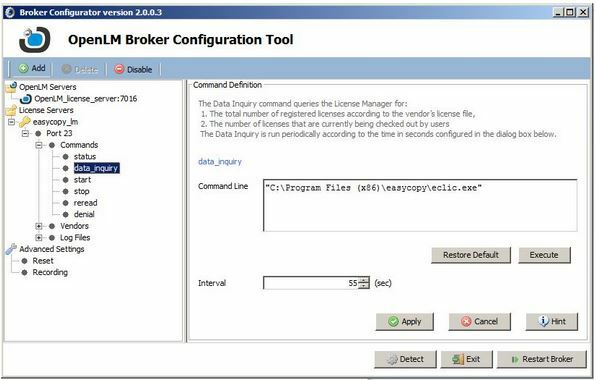 Unchecked: Usage information is obtained solely by the OpenLM Broker installation on the License manager machine. Click Apply, and then consecutively the Restart now button. 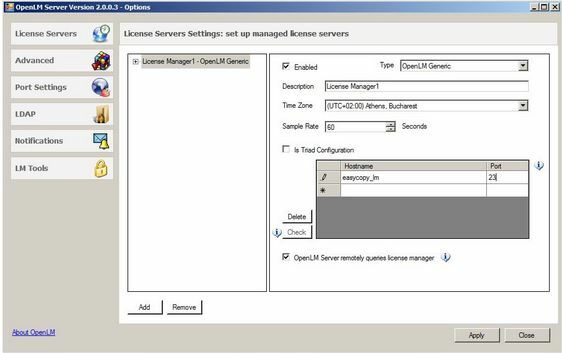 The EasyCopy Licence Manager server is now ready to interface with OpenLM. 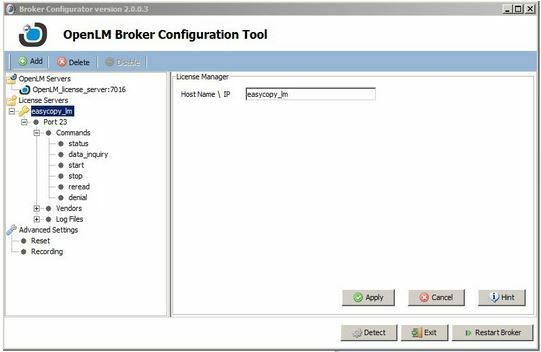 Set the OpenLM Server hostname to OpenLM_license_server. Set the Port number to its default of 7016. Highlight the License Servers and then click Add and then License Server above and submit a title for the License Manager. Click Apply. To add a Port, highlight the newly named License server, click on the easycopy_lm that sits under the License Server. Click Add and highlight Port and click OK. Using the information from the Server settings (listed above), enter same information for the Port Number and using the drop-down menu, select OpenLM_Generic. Click Apply and then OK.
Open the Commands section and select data_entry. In the Command Line, type the following: “C:\Program Files (x86)\easycopy\eclic.exe” . The command is “eclic openlm” and it needs to be run from the location of the eclic.exe path. Click the ‘execute’ button to check the operation of the Data Inquiry. Click the ‘Apply’ and “Restart Broker” buttons.